The antifungal activity of fifteen wild plant species grown in the Al-Qassim region, Saudi Arabia, was investigated against the fungi species Fusarium solani, Botrytis cinerea, Alternaria alternata and Stemphylium botryosum at concentrations of 10, 20, 40 and 80 g/L. The inhibitory effect of test extracts varied among examined fungi, and Fusarium solani exhibited the least sensitivity compared to other fungi species. Antifungal activity of the tested extracts was proportional to the applied dose. Extracts of Lactuca virosa, Neurada procumbens, Ochradenus baccatus and Cyperus conglomerates showed relatively low inhibition effects on the fungi species. The most effective plants were Pulicaria undulata, Artemisia monosperma, Prosopis juliflora, Withania somnifera and Rumex vesicarius. At 80 g/L, extracts of these plant species reduced mycelial growth of Botrytis cinerea by 16.5–32.2%, of Fusarium solani by 11.1–27.9%, of Alternaria alternaae by 26.9–63.5% and of Stemphylium botryosum by 22–40%. The methanolic extract of the most effective plant species was further fractioned with hexane, methylene chloride and ethyl acetate. The obtained fractions varied in their effects on mycelial growth of the four tested fungi. Using the same fraction resulted in different inhibition effects on mycelial growth of all tested fungi. The antifungal activity of each crude extract tended to be distributed among its three fractions, probably because the bioactive components were also distributed among the fractions. Die antimykotische Aktivität von 15 Wildpflanzenarten, die in der Region Al-Qassim, Saudi-Arabien, angebaut wurden, gegen die Pilzarten Fusarium solani, Botrytis cinerea, Alternaria alternata und Stemphylium botryosum wurde in Konzentrationen von 10, 20, 40 und 80 g/l untersucht. Die hemmende Wirkung der Testextrakte auf die untersuchten Pilze war unterschiedlich, und Fusarium solani zeigte im Vergleich zu anderen Pilzen die geringste Empfindlichkeit. Die antimykotische Aktivität der getesteten Extrakte war proportional zur applizierten Dosis. Extrakte aus Lactuca virosa, Neurada procumbens, Ochradenus baccatus und Cyperus conglomerates zeigten relativ geringe Hemmwirkungen auf die Pilzarten. Die wirksamsten Pflanzen waren Pulicaria undulata, Artemisia monosperma, Prosopis juliflora, Withania somnifera und Rumex vesicarius. 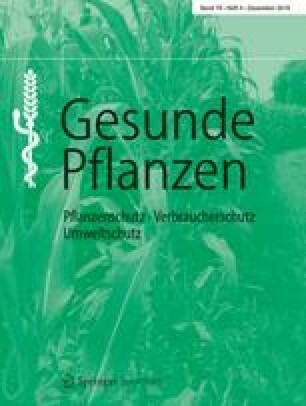 Bei 80 g/l reduzierten die Extrakte dieser Pflanzenarten das myzeliale Wachstum von Botrytis cinerea um 16,5–32,2 %, von Fusarium solani um 11,1–27,9 %, von Alternaria alternaae um 26,9–63,5 % und von Stemphylium botryosum um 22–40 %. Der methanolische Extrakt der effektivsten Pflanzenarten wurde mit Hexan, Dichlormethan und Ethylacetat weiter fraktioniert. Die erhaltenen Fraktionen variierten in ihren Auswirkungen auf das Myzelwachstum der 4 getesteten Pilze. Unter Verwendung derselben Fraktion war die Hemmwirkung auf die 4 getesteten Pilze unterschiedlich. Die antimykotische Aktivität jedes Rohextrakts verteilte sich tendenziell auf seine 3 Fraktionen – wahrscheinlich, weil auch die bioaktiven Komponenten auf die Fraktionen aufgeteilt wurden. We thank the Promising Research Centre in Biological Control and Agricultural Information (BCARC), Qassim University, Saudi Arabia, for the financial support.